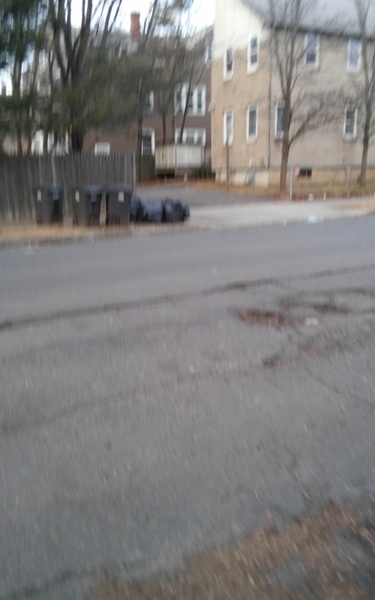 All to there trash in black bags not putting in can. We will investigate this matter at this location as soon as possible. Thanks for reporting. This area is long and wide. The water stands inside at least a week or more. It ruins tour tires to or even a flat along with the bad curbside. They all so leave cans out all week long. Theekir is a sign posted We Buy. HOUSES IT WAS TOLD THAT IT IS SCAM. On the corner of Sherman ave And Gilbert ave going towards Dr MLKing. ave. On the corner in front of the white house gets flooded all the time after hard rain fall only drainage on that side is in front of 156 Gilbert ave and 186 Gilbert at the end and corner of Winthrop ave. It is bad in the morning for the children waiting for the bus. They have to wait across the street. People are crossing on Sherman ave to walk in the street to get to other side. We need to have a bio-well on that side from that corner. On the even side of Gilbert Ave between Sherman ave and Winthrop ave. This curb is old. The other side of the street is new.We need to have a new curb done. This is really messing up my tires and my rims due to that you can not tell if your on the side walk or street and it is a mess with the bad drainage. The tenant that stays in Green three story house either 146 or 148 Gilbert ave if leaving his garbage cans on the side walk all the time. He or they are not putting them in the back off the curb when it is not trash pick-up. He is having the trash to make his neighbor to get rodents. And through out the week their is piles of trash on top of the containers and on the ground.VERY! MESSY! I do not want to smell or look like New York. Parking meter 33136 on Sherman Ave and cx streets Chapel & George is not working. Please fix this asap.